21 Lessons for the 21st Century Summary - In an era of relentless change and uncertain futures, governments and individuals alike are grappling with technological, political and social issues unique to the twenty-first century. What’s in it for me? Futureproof yourself against the twenty-first century. 21 Lessons for the 21st Century Summary – In an era of relentless change and uncertain futures, governments and individuals alike are grappling with technological, political and social issues unique to the twenty-first century. How should we respond to modern-day phenomena, such as frighteningly intelligent computers, globalization, and the fake news epidemic? And what about the threat of terrorism – should we take action or take a deep breath and relax? In this article, you’ll discover the answer to all these questions and more. You’ll learn how to futureproof your children by changing your approach to education, what robots and automation mean for the future of white-collar work and why the question of immigration is threatening to destroy twenty-first-century Europe. 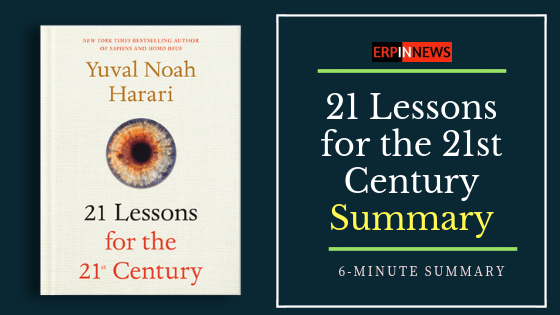 Author Yuval Noah Harari has formulated some important lessons to help us deal with these fascinating times. These blinks seek to highlight the six most crucial ones. why we need to teach our children less. Computer technology is disrupting our financial, economic and political systems. Throughout the twentieth century, three distinct political ideologies vied for world supremacy – communism, fascism and liberalism. Fast-forward to the late twentieth century and liberalism, which celebrates democracy, free enterprise and individual freedoms, was the clear winner. But how will the West’s liberal-democratic system cope in the twenty-first century? Disturbingly, its vital signs aren’t good – and the revolution in information technology is to blame. From the 1990s onward, computer technology has arguably transformed our world more than any other force. But despite its massive impact, most politicians seem hardly able to comprehend this new innovation and are even less capable of controlling it. Just consider the world of finance. Computers have already made our financial system fiendishly complicated – so much so, that very few humans are now able to understand how it works. As the twenty-first century continues and artificial intelligence advances, we may reach a stage where no human will be able to make any sense of financial data. The implications of this scenario for our political process are disturbing. Just imagine a future where governments have to patiently wait for algorithms to give them the green light on their budget or their tax-reform plans. Unfortunately, for many twenty-first-century politicians, technological disruption isn’t at the top of the agenda. For instance, during the 2016 American presidential election, neither Donald Trump nor Hillary Clinton discussed the implications of……..